With a selection of great streaming services grabbing our attention, many modern devices shipping without optical drives, and Windows 10 ditching its classic Media Center, watching a movie or TV show from a disc on your PC today isn’t easy. It’s not impossible though. There are a few tricks and a few methods you can use to get your fix of classic physical media on a modern Windows machine. Here’s how to watch DVDs and Blu-rays for free in Windows 10, in just a few steps. If you find that your PC or laptop doesn’t actually have a drive to play your DVD or Blu-ray in, you’re not alone. Many PCs and especially laptops, don’t ship out with a DVD drive at all anymore for space and cost saving reasons. Even those that do are unlikely to have a Blu-ray drive built into them. 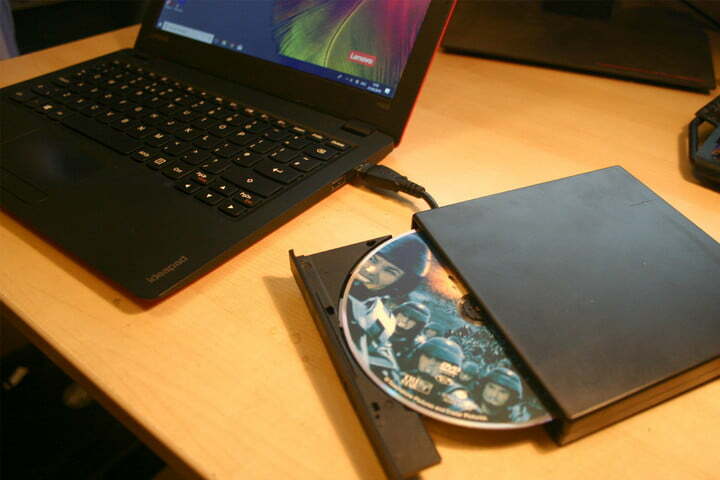 Fortunately, many manufacturers have stepped up to solve this issue by creating a bevy of external and add-in optical drives in all shapes and sizes to help you scratch that physical media itch. The easiest drive to use is an external one because you can plug it in as and when you need it, and then put it away when it isn’t required. Depending on whether you want the ability to burn your own DVD/Blu-ray discs (often called a writer or rewriter) these can range in price from $20-$40 for a DVD drive and between $50 and $100 for a Blu-ray drive. Drives that can play but not write DVDs or Blu-rays tend to be on the cheaper end of the spectrum. Most external optical drives, whatever they play and whether they write or not, use a USB cable to connect to your PC or laptop. Make sure that it is the correct type for your system. If your laptop only has USB-C ports, you may need to buy an adapter. Alternatively, if you’re using a desktop and you’d rather not mess around with external drives, you could always install an internal drive. Prices are comparable to external drives for both DVD and Blu-ray players, but you should make sure you know how to put together a computer first, as you’ll need to have a spare SATA and power cable for the drive. You should also make sure you have enough space for a new optical drive in your case. Once that you have an optical drive, all you need is some software. 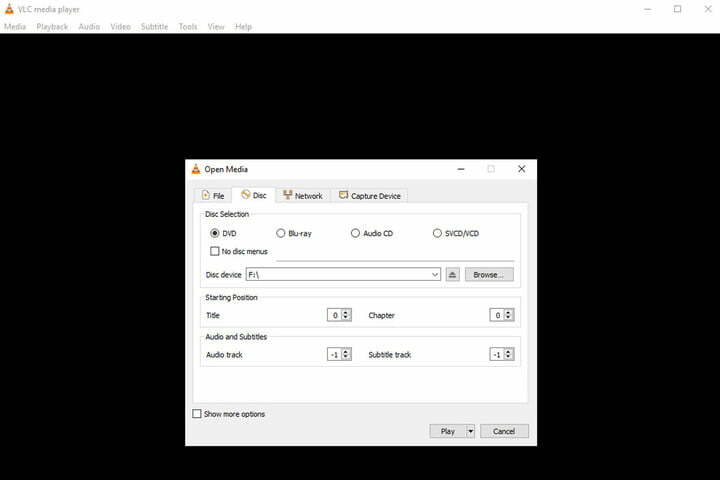 There are a number of applications that can help you play a DVD or Blu-ray in Windows, but VLC is our favorite. It’s open source, well tested, and most importantly, it’s free. Download it from the official website and install it like you would any other applications. Open VLC if it isn’t already. Then make sure your drive is connected (if external) and put the DVD or Blu-ray in. VLC should automatically detect the disc and begin to play it like you were watching it on a TV-connected DVD or Blu-ray player. If that doesn’t work, play it manually within VLC by going to Media > Open Disk. If required, select the drive in question from the drop-down menu and press Play. Note: If you’re still having trouble getting the DVD or Blu-ray to play, you may need to set your drive’s region to that of the disc you’re trying to watch. To do so, type Device Manager into the Windows 10 search bar and select the corresponding result. Find your DVD/Blu-ray drive in the list and right-click (or tap and hold) and select Properties. Select the Region tab and use the menu to select your country. Bear in mind, you can only do this a limited number of times. If you’re not a VLC fan or for whatever reason run into problems getting it to work as intended, a great alternative is 5K Player. While there can be a lot of nonsense to ignore on its download page, once you get hold of the application itself, it’s an impressively versatile tool for media viewing. That includes watching DVDs and Blu-rays. To use it, start up the app and select the DVD icon on its main page. Then simply select the drive that contains the DVD or Blu-ray that you want to start watching. Then select the blue Play button.